Danaus was a king in Greek mythology, firstly a ruler of Libya, he would later become king of Argos, and the eponymous hero of the Danaan. The first of Danaus’ descendants were his daughters, the 50 Danaids. In later mythology, the Danaids were also famous inmates of Tartarus, where they faced eternal punishment, although how they ended up in Tartarus is never made clear. The story of the Danaids commences in Africa, or as the land was then known Libya; later the continent would be subdivided into Libya, Egypt and Aethiopia. At the time Danaus was ruler of Libya, having succeeded his father Belus; Belus was son of Epaphus, son of Io and Zeus. By various wives, including Memphis, Elephantis, Europe, Crino, Atlanteia, Polyxo, Pieria and Herse, Danaus would become father to 50 daughters, daughters who were collectively known as the Danaids. King Danaus had a brother called Aegyptus, who had been given rule over Arabia, when Danaus had been given Libya. Aegyptus had also become a prolific producer of children for Aegyptus was said to have 50 sons by various wives. Trouble occurred when Aegyptus decided to expand his kingdom, and he looked eastwards to the land of the Melampodes. This land was easily conquered by Aegyptus and his sons, and Aegyptus named the land after himself, Egypt. This land was nominally though part of the kingdom of Danaus, and the king of Libya was fearful about the might of Aegyptus and what further land he might lose. Aegyptus then decided that his 50 sons should marry his 50 nieces, and so word was sent to Danaus to arrange the nuptials. Fearful for himself and his daughters, Danaus decides to leave behind his kingdom. To make their escape, Danaus then designs and has built the largest ship to have been thus crafted; thus, Danaus and the Danaids depart Africa. Danaus and his daughters first come to the island of Rhodes, and there new settlements and sanctuaries are constructed. Rhodes though, would be but a stopping off point, for Danaus had set his heart on returning to the land of his ancestor Io, Argos. Danaus and the Danaids arrive in Argos, but the land was at the time ruled by Gelanor, who some called Pelasgus, who himself was a descendant of the river god Inachus, just as Danaus was. Gelanor was said to have been welcoming to the refugees from Africa, but was aware of the dangers of offering sanctuary might bring. To this end some tell of him getting his subjects to vote on whether to allow Danaus and the Danaids to stay. Other stories tell of Gelanor willingly giving up his throne to Danaus, either because of the advice of an Oracle, or because he had witnessed a wolf killing a bull, and took this as an omen that Danaus was to succeed him. In either case, Danaus became the new king of Argos, and the population, as well as being called Argives, were also named Danaans. One of the first things that Danaus then did was to construct a temple to Apollo, believing that it was the Olympian god who had guided Gelanor’s decision. Additionally, Danaus also constructed temples and sanctuaries to Zeus, Hera and Artemis, for after all, it was never a mistake to have too many deities inclined to think well of you. Aegyptus had not forgotten that he intended his sons to marry the Danaids though, and eventually the spies of Aegyptus located them in their new homeland. Aegyptus and his sons would thus also arrive in Argos. Danaus now sought to avoid war, and it seemed that the King of Argos now agreed that his daughters should marry his nephews. Lots were drawn to decide which Danaid would marry which son of Aegyptus, but Danaus was planning to double cross his brother. Danaus instructed each of his daughters to take a sword, and when their husband came to them, they were to kill them. That night, all bar one of the Danaids followed their father’s wishes, and Aegyptus awoke to find that 49 of his sons had been decapitated during the night. The shock and grief was sufficient to kill Aegyptus. The heads of the deceased sons of Aegyptus were subsequently buried in Lerna. One son of Aegyptus survived though, for Hypermnestra disobey her father’s instructions, for Lynceus, the intended husband of the Danaid, had respected his new wife, when she had asked that he not sleep with her. King Danaus would briefly imprison Hypermnestra for disobeying him, but Aphrodite, the goddess of Love, was said to have intervened on the behalf of the Danaid. Hypermnestra was therefore released and subsequently reconciled with her father and Lynceus. Some tell of Lynceus having his revenge upon Danaus by killing the man who had caused the death of his father and brothers, but in most cases Danaus lived until old age, and the King of Argos made Lynceus his heir. Lynceus and Hypermnestra would have one son, Abas, who would also be a future king of Argos, who in turn was father of Acrisius, grandfather of Danae, and great grandfather of Perseus. As to the other Danaids, the theory was that they had each committed a great crime by killing their new husbands, but Zeus was friendly towards Danaus, after all he had built a great temple to the god, and so Zeus dispatched Athena and Hermes to absolve the Danaids of their crimes. Danaus still had a problem to deal with, for now he had 49 unmarried daughters, and suitors were wary of the dangers that might be ahead if they married a Danaid. 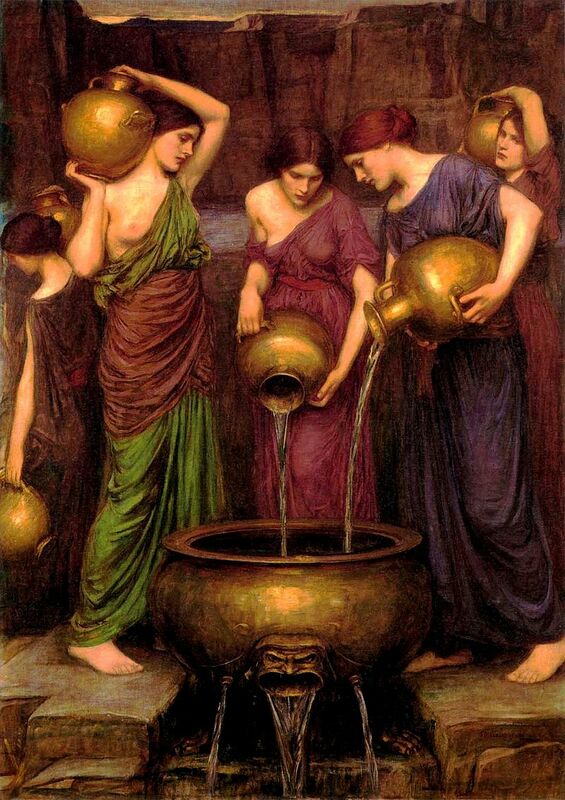 Danaus did though manage to arrange partners for his daughters, for the king of Argos organised magnificent games, where the winners of the contests undertaken received a Danaid as a prize. Two daughters of Danaus, Automate and Scaea would marry two sons of Achaeus, Architeles and Archander, and so the Danaans and Achaeans became mixed. One daughter, Amymone did not marry in this manner, for she was ravished by Poseidon, who had rescued her from a Satyr. Having been absolved of their crimes by the gods, it is difficult to understand how it was later said that 49 Danaids were to be found in Tartarus, and in truth this anomaly was never explained in ancient sources. 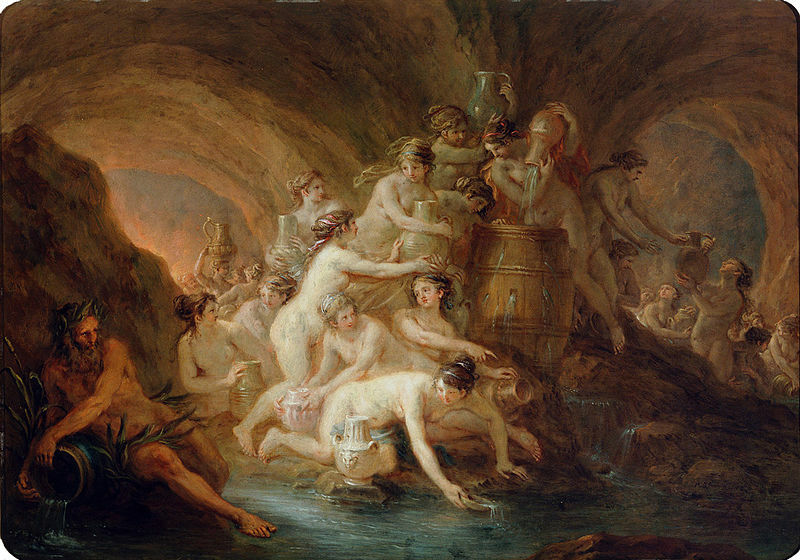 Nevertheless the Danaids were said to be found in the Underworld, where their everlasting punishment was to fill a cask, barrel or bathtub with water. The vessel though could never be filled for it was full of holes. Thus the punishment of the Danaids has much in keeping with the fruitless attempts of Sisyphus to push a rock uphill.